For years, the Zen Pinball series has been the preeminent pinball platform thanks to its wide array of retro table recreations, modern geek-friendly designs (Star Wars and Marvel), and the fact that it’s available—in one form or another—on every game-playing device that currently exists. These days, thanks to its popularity, Zen Pinball has become like a barometer for determining how cool something is. Sure, Star Wars and Marvel were cool before, but after getting virtual pinball tables, they became extra cool. 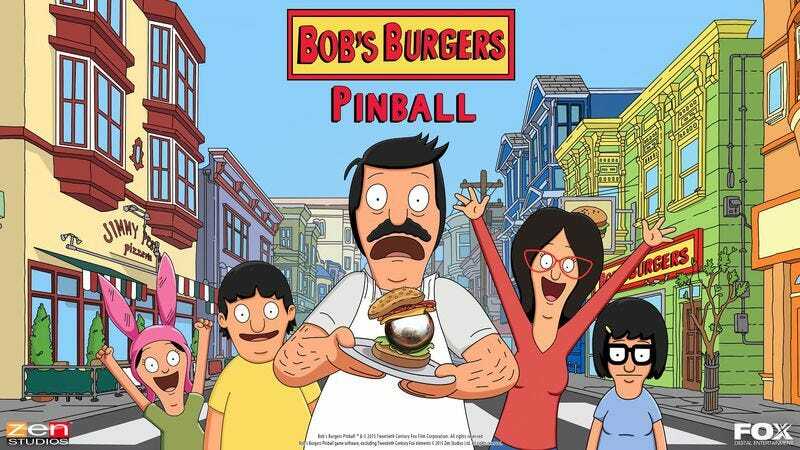 Now, Zen Pinball 2 has granted its stamp of coolness to something that we’ve all suspected was cool for a few years: Bob’s Burgers. The show will be getting its own virtual table as part of the game’s “Balls Of Glory” DLC pack at some point before the end of the year and, unsurprisingly, it looks pretty rad. The whole thing is done in a cel-shaded animation style—reminiscent of all the best cartoon-inspired video games from the PlayStation 2-era—and it features a bunch of nods to jokes and locations from the show. It has the Wonder Wharf, it has the taffy factory, and it even has Kuchi Kopi, everyone’s favorite nightlight/phantom speakeasy owner. Oddly, the one thing that seems to be missing from the table is the show’s best character, Regular Sized Rudy. Oh, and Tina isn’t there either, even though she’s easily the show’s second-best character. The “Balls Of Glory” pack will also include a Family Guy table, which probably doesn’t feature Regular Sized Rudy either, and you can see a trailer for the Bob’s Burgers table below.